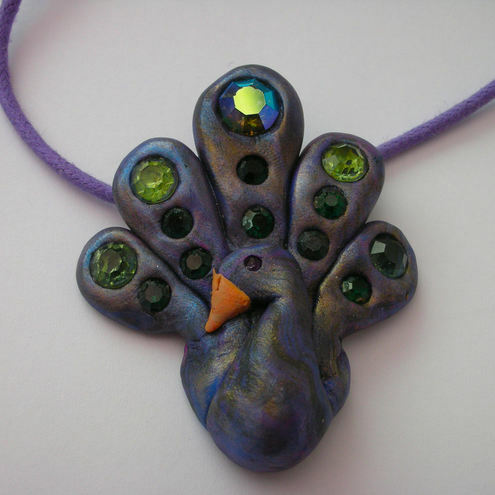 Folksy :: Buy "Peacock polymer clay pendant"
Polymer clay peacock pendant with glass gems from old broken jewellery. This pendant is made from marbled, purpley polymer clay. I have given the purple clay a brush with gold coloured pearl powder to gove it a golden sheen. The glass gems embedded in the clay are all recycled from broken jewellery. I have included a length of purple cotton cord but the bail is large so you can remove it if you would prefer to hang it on something else. The peocock is approximately 4.5cm (1 3/4") wide and has a drop of 5.5cm (2 1/4"). This is a one-of-a-kind (OOAK), as pictured. Your pendant will come to you in a handmade gift box. Averilpam on Folksy "Handmade Necklace Polymer Clay Purple and Light Green with Bronze "
Folksy :: Buy "Fabfic scraps, resin and sterling silver heart pendant"
Folksy handmade "Polymer Clay Textured Pendant, Metallic Bronze and Purple"